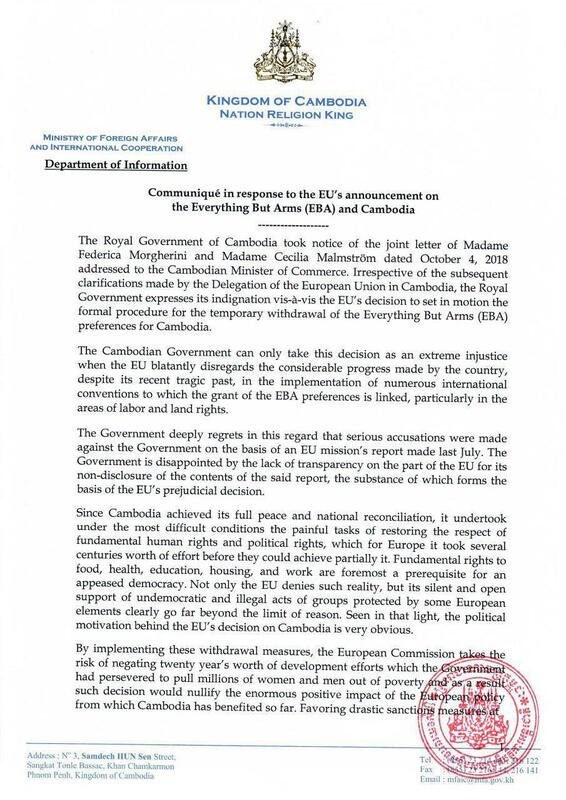 Phnom Penh (FN), Feb. 11 - The EU has today started the process that could lead to the temporary suspension of Cambodia's preferential access to the EU market under the Everything But Arms (EBA) trade scheme, according to the European Commission’s press release dated 11 February 2019. “EBA preferences can be removed if beneficiary countries fail to respect core human rights and labour rights,” the press release added. 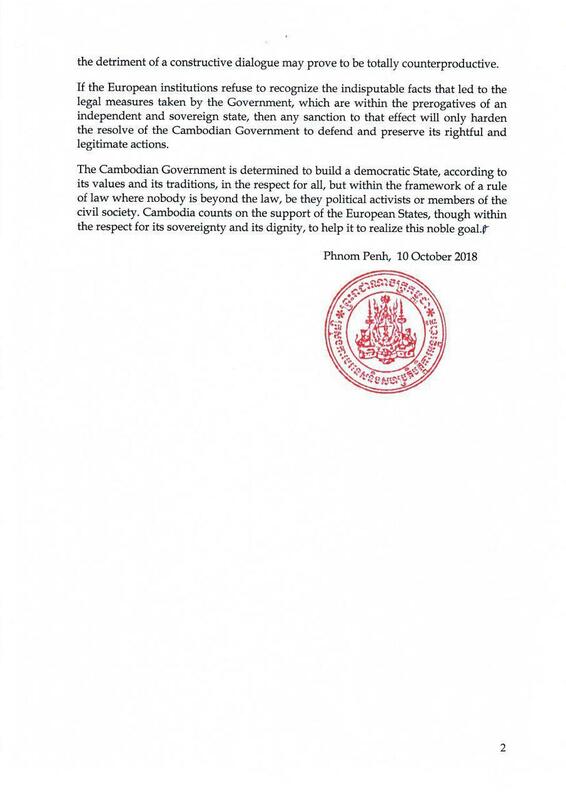 Cambodian Ministry of Foreign Affairs, on 10 October 2018, released a communiqué in response to the EU’s announcement on the Everything But Arms (EBA) and Cambodia. “The Cambodian Government can only take this decision as an extreme injustice when the EU blatantly disregards the considerable progress made by the country, despite its recent tragic past, in the implementation of numerous international conventions to which the grant of the EBA preferences is linked, particularly in the areas of labor and land rights,” the ministry wrote. “The Government deeply regrets in this regard that serious accusations were made against the Government on the basis of an EU mission’s report made last July. 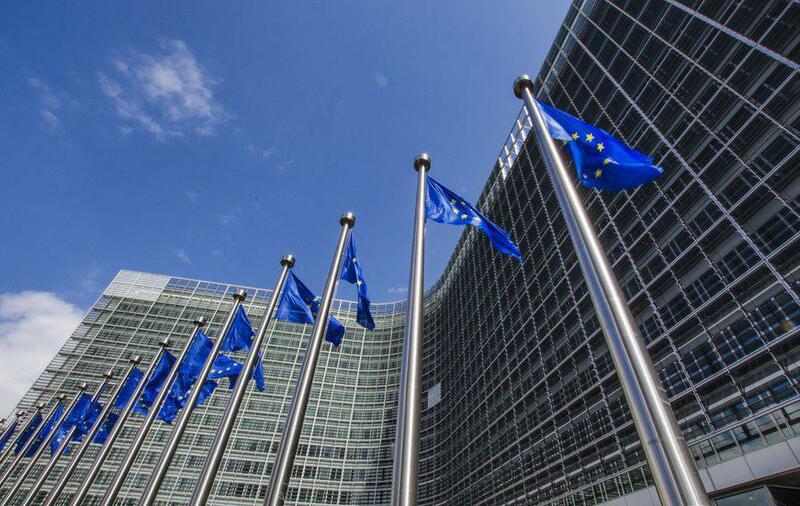 The Government is disappointed by the lack of transparency on the part of the EU for its non-disclosure of the contents of the said report, the substance of which forms the basis of the EU’s prejudicial decision,” it added.